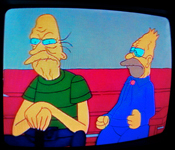 Apparently the self-appointed Statler and Waldorf of Springfield, the Winfields were an elderly couple whose only joy in life appeared to come from sitting on the porch late at night (really, really late at night), making snide comments about passerby, especially suicidal ones, and then cackling madly at their own jokes. However, all that laughter couldn't fill the void left by Mrs. Winfield's barren, childless womb. Since Ruth and Laura Powers moved into their house in Season 4, I think it's safe to assume that the Winfields are dead, mourned by no one and forgotten by everyone. 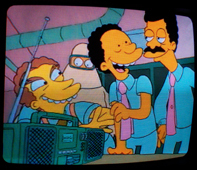 Identity: Power plant employee, possibly Homer's supervisor? 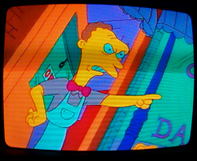 Back before they redid the opening sequence in Season 2 and added Mr. Burns & Smithers, there was a guy eating a sandwich with tongs over in the little control room. Why he's eating a sandwich with tongs and big safety gloves, I don't know. Maybe he's just following the "Be Careful" sign to the letter. Note the way he just stares at the sandwich until the whistle blows, and then eats it: just how long was he staring at it for??? Quote: Oh, thank you, Mr. Burns. I'm so glad you invited us. / Not me. I had to miss little league for this. / Quiet, Tom. Stepping out from the pages of a New Yorker cartoon, this family came and went with nary a whimper. Mr. Burns fired the father for his family's "unpleasantness" later in the day. Good thing too, because he looks like an alcoholic. And what's up with his wife's eyebrows? Temporaily confusing cuteness with freakishness, Marge compliments a fellow mother on her "adorable little girl," a scary monstrosity with eight eyelashes. Unceremoniously dumped in a nursery while her mother goes to drink alcohol-spiked punch, this baby is never seen again. Kind of makes you think. Now that's the kind of family unity Mr. Burns likes to see. The Perfect Family is unlike the Simpsons in every way - they're nice to each other, they're polite, they enjoy company picnics, and they sing songs as their car ascends to heaven. They are later seen at Dr. Marvin Monroe's Family Therapy Center, leaving one to wonder just what sordid skeletons this family keeps buried deep within in their closet. Was that innocent kiss really so innocent? 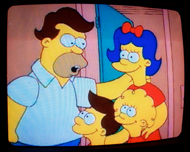 A rather grotesque looking family with big, big un-Simpsons-like smiles that appears to be having Thanksgiving dinner. Why are they having Thanksgiving when it's clearly not Thanksgiving? Are they trapped in some hellish Groundhog Day-ish time warp where they are forced to relive Thanksgiving over and over? The world may never know. This guy looks a lot like Lenny, except old. 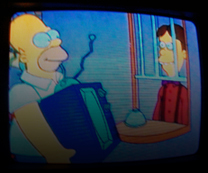 Could Homer's good friend Lenny secretly be a time-traveller??? Quote: Mister, you got yourself a deal. 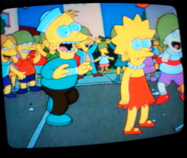 This guy is pretty much the creepiest looking guy ever seen in The Simpsons. Looking like either an extra from Deliverance or a bad caricature of Steve Buscemi, he takes a somewhat perverted pleasure in buying the Simpsons' iconic television. What's he hiding behind that barred window? Quote: Come on, family. Let's go celebrate our newfound ability to express love for each other. I'm taking you out for frosty chocolate milkshakes. What are the odds that two families that bare such striking resemblance to each other would be in the same place at the same time? Why does Bizarro Marge have a bow in her hair when she's at least in her late 20s? Why does she look like she's from the 1950s while Bizarro Homer looks like he's from the 1970s? And what did they do to Bizarro Maggie? Lisa's baked some cupcakes for her classmates. She arrives at school and offers one to her fair-weather friend Janey, only to have them intercepted by one of Nelson's weasels. But wait a minute! That's not the Janey we all know and love! She's... white! Are these Janeys the same girl? Or does Lisa just have multiple friends who happen to share the same name? Some weird kid in a sailor hat who gets off on re-enacting famous World War II photographs. Man, just look at that kid's face! I wonder if he normally wears that hat, or if he just put it on for the occasion. Possibly Lisa's first kiss, as opposed to Lisa's Date With Density. Quote: Hey Homer, ain't that your wife? Man, these guys just love rather mild domestic squabbles! The two guys on the right are wearing the exact same outfit - are they twins, lovers, or both? And the wolfish guy on the left - from the looks of it, bad things happening to other people is the only thing he derives any kind of joy from. I bet he laughs at orphanages burning down. Quote: Hey! Hey, you! Hey! Hey, you! Mr. Dandy is a candy man with a fervent passion for town founder Jebediah Springfield, scolding Bart, Jimbo, Dolph and Kearney when he catches them throwing rocks at the town square statue of his beloved embiggener. "Show a little respect, you insolent little thugs!" Quote: Well, we have some beautiful long-stem roses... they're fifty-five dollars a dozen. Continuing the trend of shopkeepers with names that rhyme or almost rhyme with what they sell, Howard is a botanical elitist who takes his job very seriously. So much so that he seems quite peeved when a customer actually enters his store, and visibly restrains his frustration when Homer asks for "pretty" flowers. Man, the laughs just keep rolling in. This guy is so infuriated that someone sawed off Jebidiah Springfield's head that all he can do is furrow his overbite angrily in support of Abe's suggestion that the authorites cut the head cutter's head off. Hell in a handbasket!